Adjustable double rack fits 2 large kayaks - 150 lb. capacity! 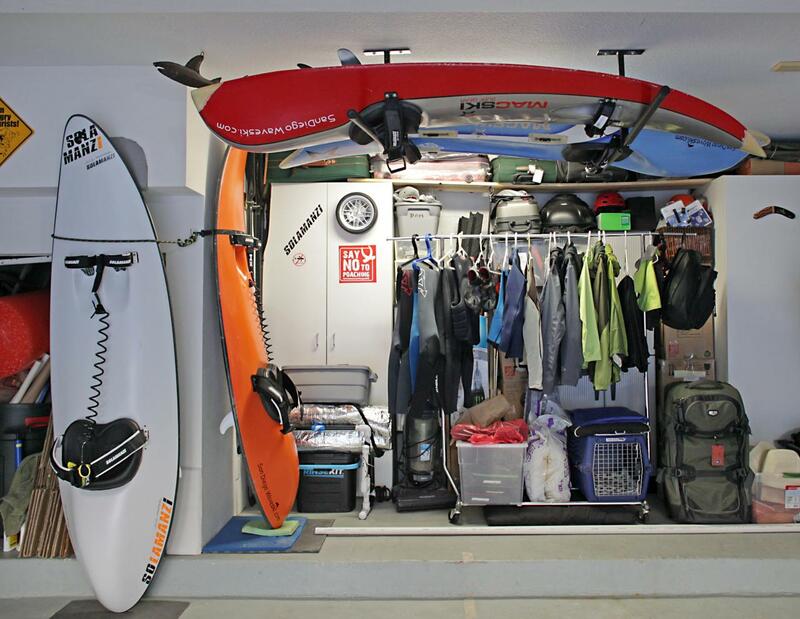 We love overhead storage for the same reasons you do. It gets your kayaks up and out of the way! 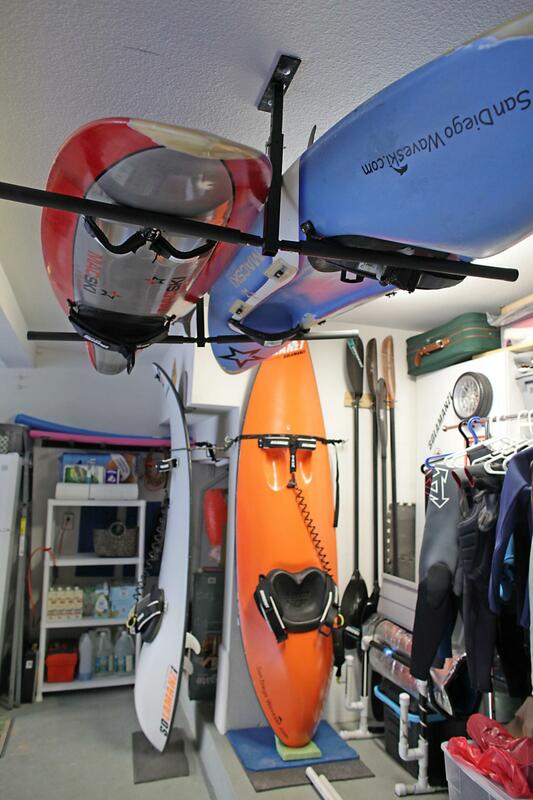 But most overhead racks aren't equipped to handle a kayak's size. 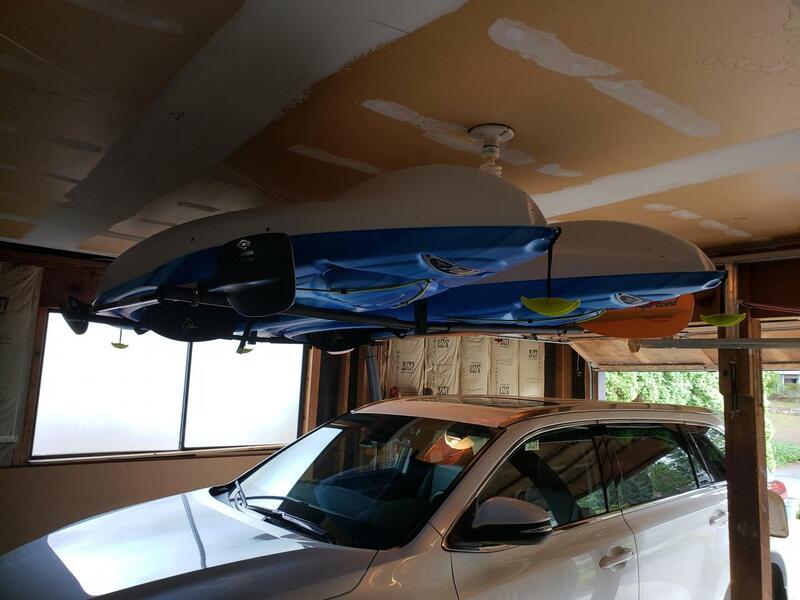 Hoists works great, but they can only handle one kayak. So we went ahead and designed the versatile Hi-Port 2. 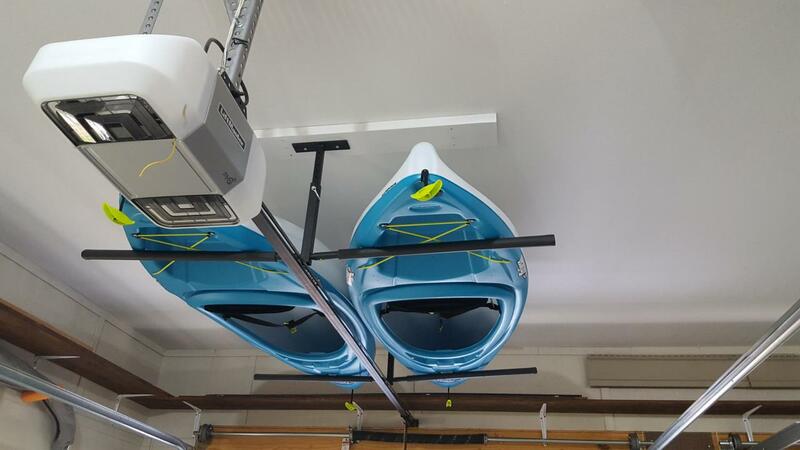 With it's multiple extension points, 90 degree rotational capabilities and overbuilt support arms, it's the perfect solution for any twin kayak storage needs. The points below illustrate the range of issues the Hi-Port 2 has addressed. 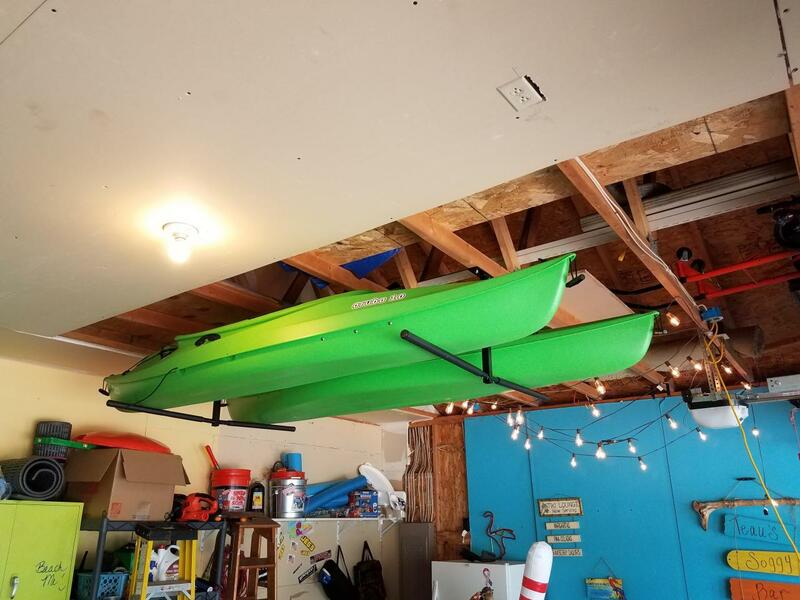 2x kayak setup: Drop the center post to full extension and you'll have 18" of height between ceiling and arms; plenty of height for kayaks. Each of the 2 posts is individually mounted so kayak length won't be an issue, whether you have a 10' fishing kayak or 18' sea kayak. 2 size options to fit your kayak's width: The removable arms extend 25" (Large) or 30" (XL) from the center post and attach at a slightly upward angle. This allows you to confidently place your kayaks on either side and ensure firm support. 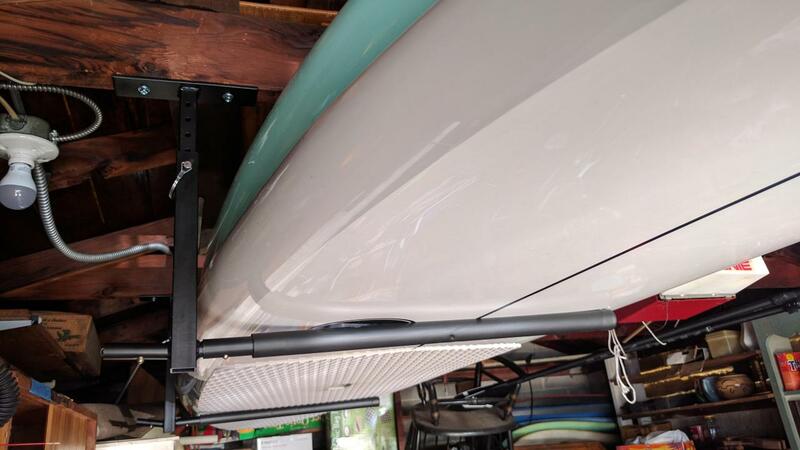 For wider fishing kayaks we recommend the 30 " (XL) version to provide adequate support of your wider boats. NEW (2018) upgraded hardware: Listening to customer feedback, we've upgraded our hardware to heavy duty screws that install easier. 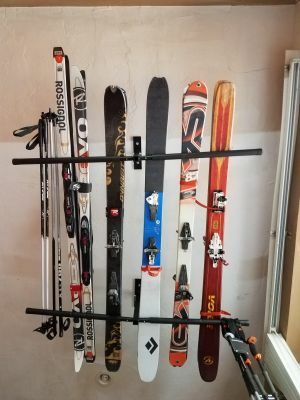 Height: Adjustable 10" up to 18"
Hey guys, this is mark at storyourboard and with me here I have a freestanding snowboard storage rack. 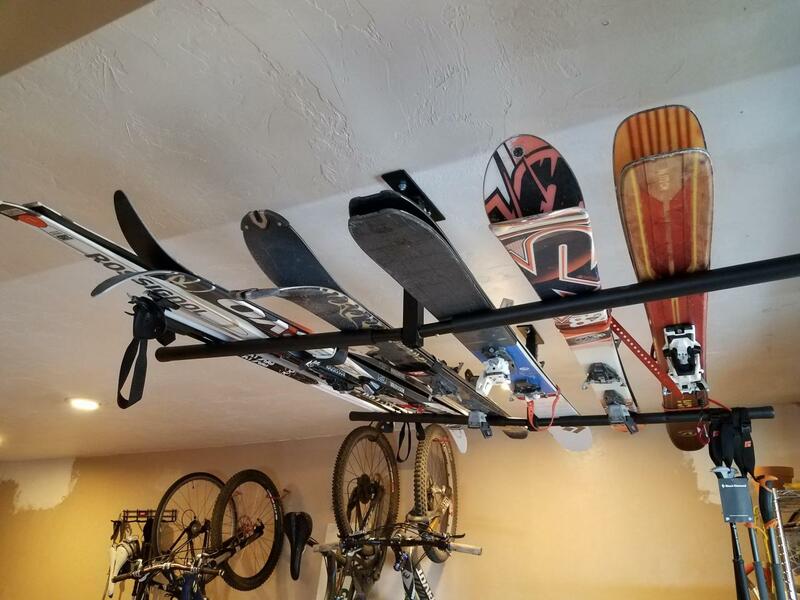 This rack is a great way to store up to four snowboards, offers a nice and vertical display of your boards as well as extra storage in between runs or during the off season. We don't need your year. 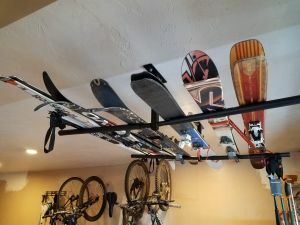 One of the neat things about this rack is that it comes fully assembled, doesn't require any tools drilling into your wall or any installation required. The rack is made of heavy duty, rigid plastic, waterproof. 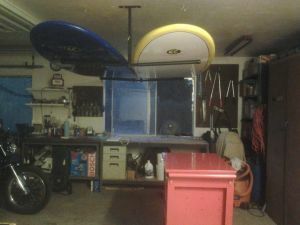 Going to worry about any rusting or warping of wood on the top there for individual slots to slide in your boards, each measuring 11 and a half inches wide and 14 inches deep. You can even load your boards with the bindings still attempts. Just be sure to double check that measurement on the tail on your board. Make sure you have that full 14 inches so it can slide all the way down to the rack. Rest on the bottom for a nice secure, stable grip. The only thing you need to do out of the box as pop on the two support legs here y'all send to the bottom of the rack, has an open concept design. This allows for easy drainage and water at the bottom. If you're loading your boards right off the slopes, still a little snow covered, especially in your bindings last that snow to melt drain, very nice and easy at the bottom. The rack is very easy and simple to use. Simply load and unload your boards by feeding it through the top slot and feed it back down to on the support leg for a nice easy vertical storage. 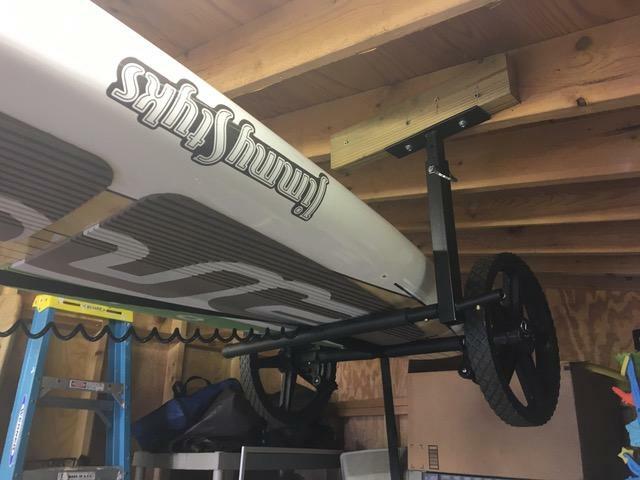 Another convenient feature about this rack is how compact and lightweight it is, makes it very easy to take it from your garage at home or in your car. Take it up to the ski lodge for the weekend for easy access to your board's lawyer coming on and off the slopes. We also offer this rack has a retail store option. It makes for a great display, comes in a multi row option for larger capacity and stores up to 16 boards. You can check it out as well as all of our other snowboard storage solutions, at storeyourboard. 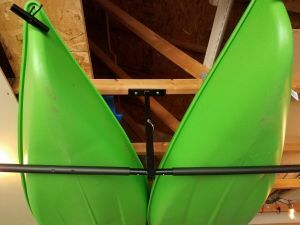 What are the pre-drilled hole sizes in the top flange of your overhead tee-shaped kayak storage brackets (ie holes for inserting lag screws into overhead joists)? The predrilled holes are about 7.5mm or 0.3" in diameter. 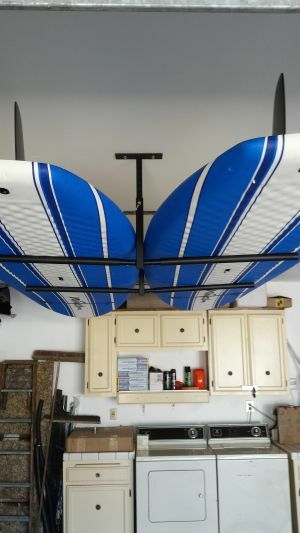 Would this ceiling rack work outdoors under an enclosed deck/porch, or would exposure to the outside not be recommended? 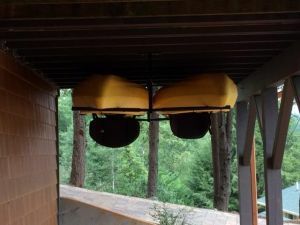 The Hi-Port 2 would need to attach to ceiling joists, for starters, so your enclosed deck/porch would need to have adequate joists to mount it to for use there. Then, as for outdoor use: it is not stainless steel or aluminum or other marine grade material, so I would *not* recommend it for use outdoors if you are in a saltwater area, as it would be subject to corrosion. 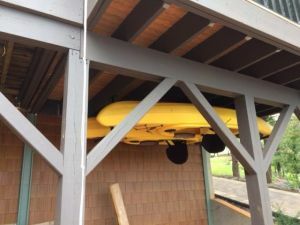 It is powder-coated, to help prevent rust & corrosion, so if you are not in a saltwater/salt air area, it could be used outdoors in that environment. Will this work fine if there is only 1 side loaded or does it need weight on both sides? Our Hi-Port 2 works fine for using just one side of it, as long as it is properly mounted according to the instructions, to your ceiling! 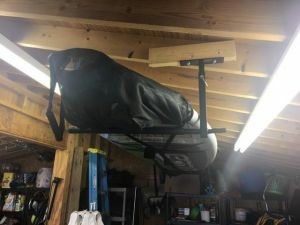 The only note is that you want to make sure you don't overload that side, as you don't want to place more than 75 lbs on each side (for a total of 150 lbs max if using both sides), but if you are just using the one side, it should still have no more than 75 lbs total on that side. As an added feature, the arms are removable, so if you don't currently need the other side, you can remove those arms, but put them back on should you decide to use it for more storage! Should we get the 25" or 30" arm length for a 29" wide kayak? Personally, I would go with the larger arm size (30") of this kayak ceiling rack, for your kayak. That way the full kayak is completely supported on the rack. The 25" arm would be alright though, as it is close -- and having a few inches of a kayak extending over the arms can be fine, especially since kayaks tend to be widest in the middle, narrowing at the bow & stern so that would be enough coverage/support overall. But if you have the overhead space, the longer arm will provide more support for the boat. 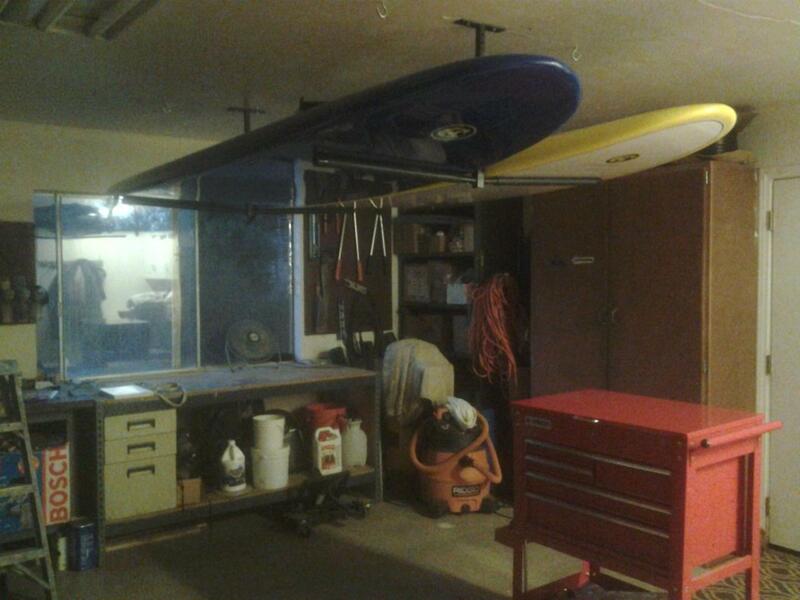 I was fully prepared to DIY a way to put my two kayaks in the unused ceiling space of my garage. Then at the last minute I "googled" kayak storage and the Hi-Port 2 came up in the first window. Just like the video promised, the product was delivered fast. It was easy to install with some prior knowledge of common tools. Construction is very good. 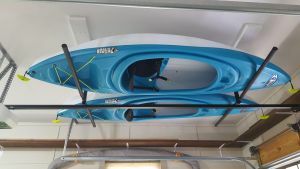 I've had my two kayaks (ea. about 40 - 44 lbs) stored on the Hi-Port 2 for about 3 weeks now and ...they're still hang'in high and out of my way. Easy to install and adjust. solid construction..
My wife wanted kayaks, but I had no idea how we would store them. I found this solution on line and ordered. Easy to install, well designed. Worked perfectly to place them in convenient location above the cars, and not at all in the way! 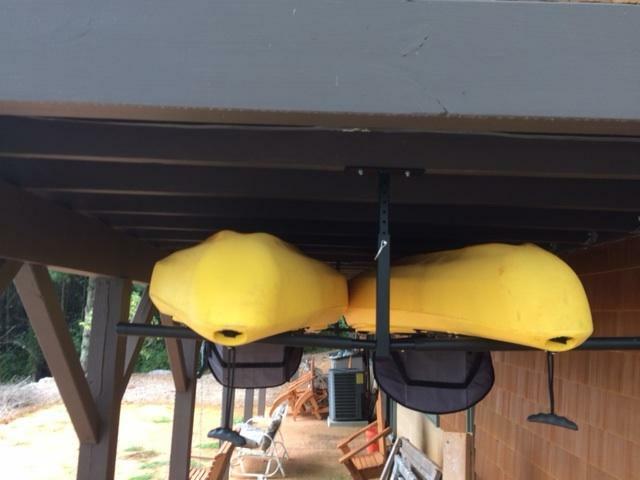 We used this rack for 2 kayaks 12'2" long and 49 pounds each. The ceiling was 10' high. 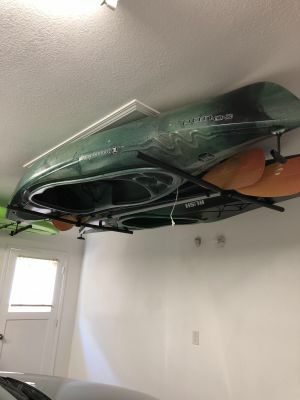 Just remember to take into consideration the width of the kayaks when mounting rack to the ceiling. That way you will give yourself room to place the kayak on the rack. I never rate above 4 star or good. Thinking about getting a second Hi-Port 2 for our boat dock. Very easy to install...the provided fasteners were very good quality and allowed the usage of a socket to tighten. No complaints! Great product! Great design. Simple and fast install. 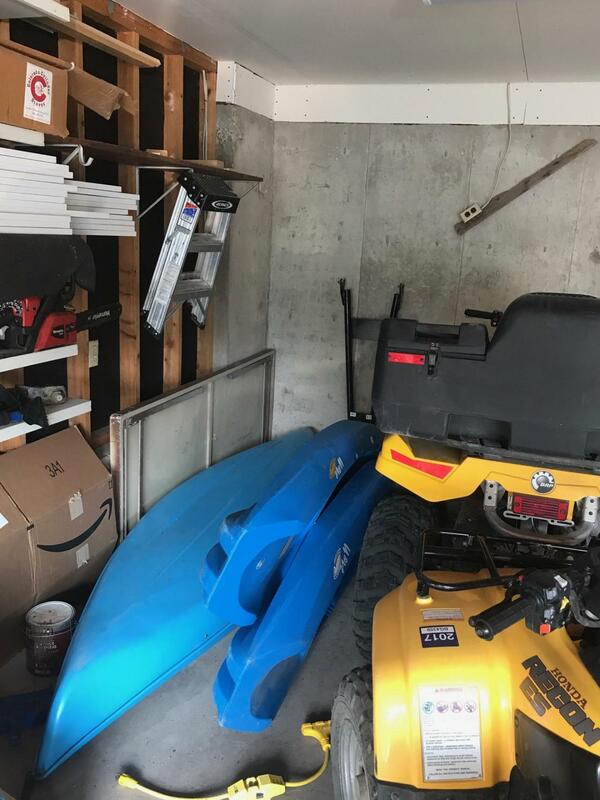 Two kayaks stored out of the way with minimal effort. Outstanding product. 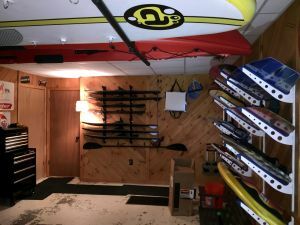 I shopped around a lot trying to find a decent, low profile storage solution for my kayaks for winter and when they are not in use. 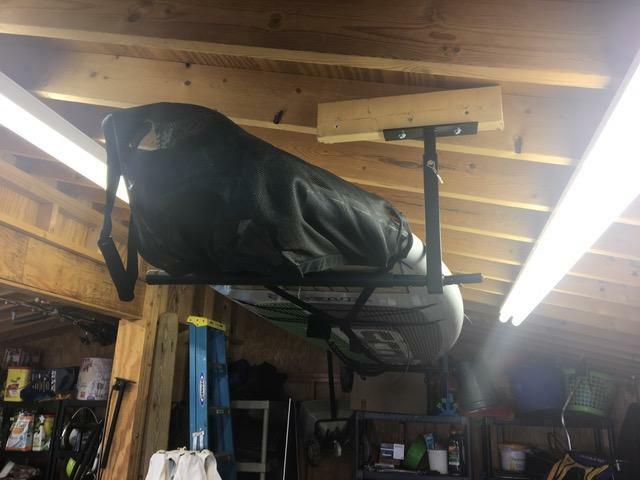 This was super easy to install, super easy to assemble and it made lifting the kayaks up and getting them out of the way so much easier. 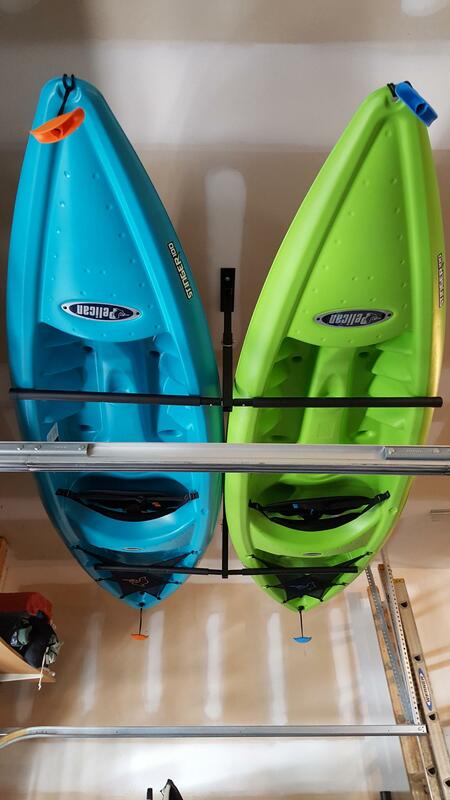 Would definitely buy another if I get more kayaks. Product arrived as advertised and is well made. 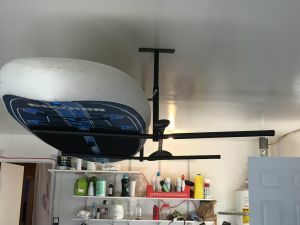 Works great against the ceiling above my garage door. I did use a longer timber screw to attach the hanger supports into my ceiling framing. The rack seems stable for one or both kayaks on the rack. 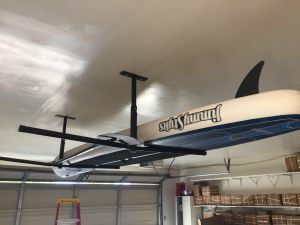 Free shipping, excellent customer service, it took me 15 minutes to install the rack (that's including the 10 minutes to take the measures and drill the holes in the ceiling). Highly recommend the Hi-Port 2, and would for sure order from you again. This item is great! It was very affordable and easy to place on the ceiling in my garage. It's holding two 10' kayaks. It looks great too. 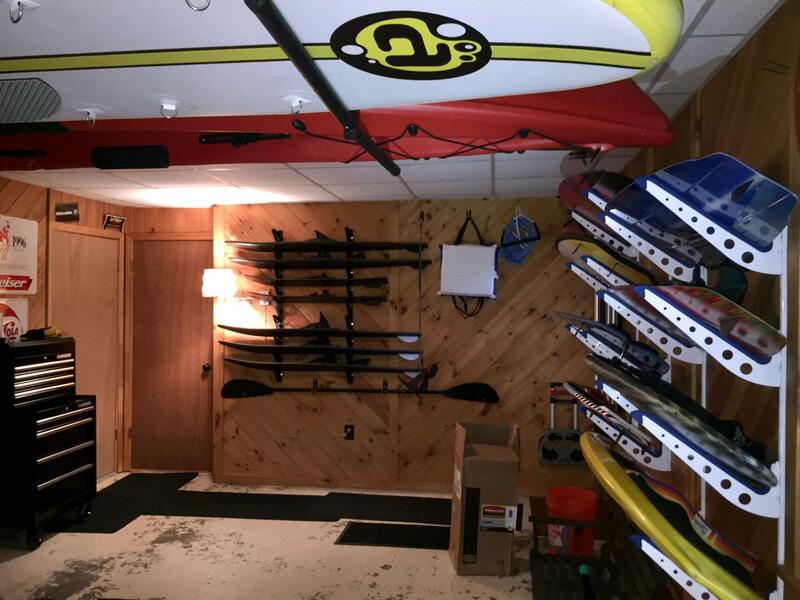 From ordering through installation Store Your Board delivered! Gave it a shot and glad we did! Found this while searching for ideas on how to fabricate our own storage mounts and for the price figured we could not go wrong. Got the brackets and can't believe how impressed we were with them. Easy to install, well built and would highly recommend. Great price and worth every penny! Excellent product. Easy to install and very well built. Just what I needed for seasonal storage of my boats. Very well constructed and a versatile design! Well-made. Easy to install, good value. I would recommend a product. As an engineer, it is always nice to purchase an item that is well designed and manufactured. Very easy to install. Instructions were clear and simple. Quick delivery, easy assembly, well made and sturdy. Nicely thought out that you can rotate the anchors to work for either direction of the ceiling studs. 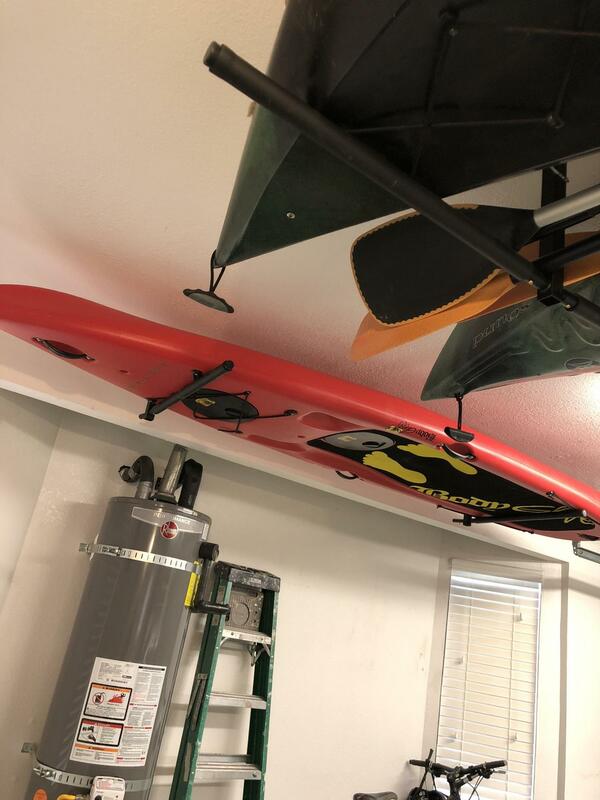 Moved to a new house without the wall space for my prior rack solution, needed to get the boat overhead. 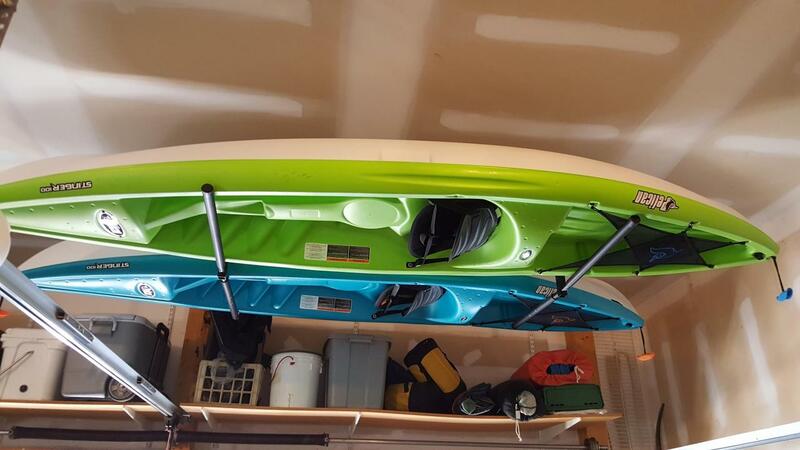 All I need now is a second kayak . Exactly the right hanger set. Suits our needs perfectly. Well built, well designed and easy to install. 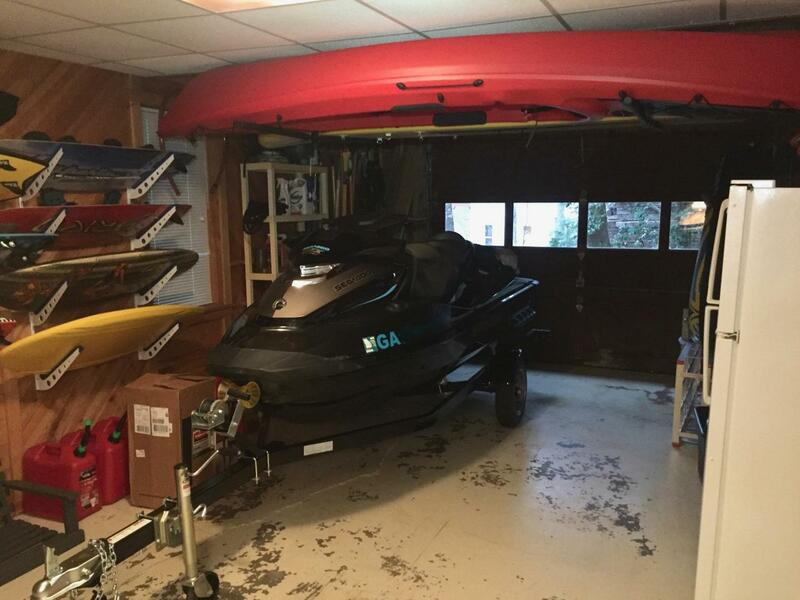 Kayaks are finally up and out of the way until needed. Highly recommend! Easy to install in about 15 minutes. 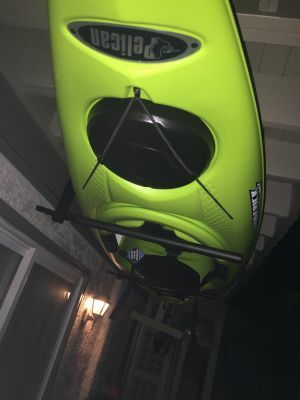 Holds my 2 kayaks with out any issues. Nothing I would change to improve on the product. 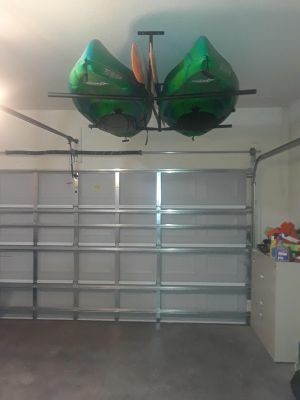 This storage system was just what we were looking for to get our kayaks off of the garage floor. They are now out of the way but still easy to get to. Highly recommend this product! The Hi-Port 2 is sturdy, easy to install and most importantly works exactly as advertised. 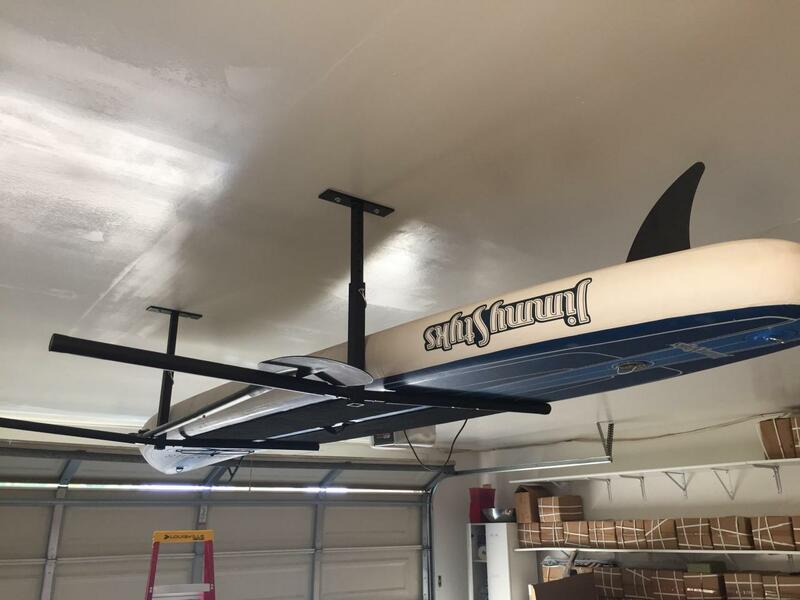 The perfect mount for getting your boats up and out of the way. Holds our two kayaks up in the garage and out of the way. Very well constructed, easy to hang. Happy we made the purchase. I was delighted with this product. 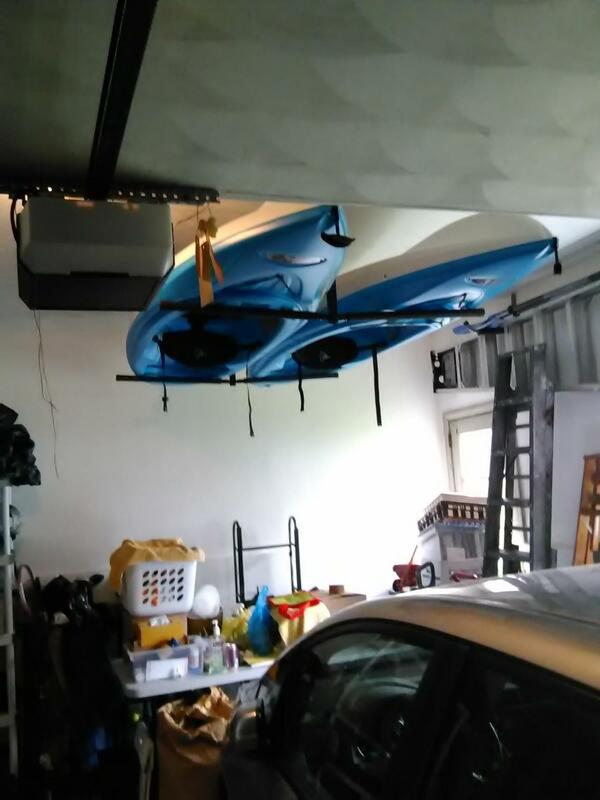 It arrived within one week and I was able to store both our kayaks above our cars in the garage. Our garage has a 10' ceiling so having brackets that extended was a real plus. I bought these after buying a system from Seattle sports I believe was the vendor. 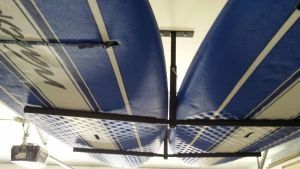 These gave me the ability to store my kayaks and sups closer to my ceiling (which was what I didn’t like about the Seattle sports product). The only thing I did like about the Seattle sports product was that it had a pulley system which made it easier to get down with one person. This system you realistically need 2 people to get them down comfortably. The only thing I would change on this system is the screws that it comes with. They work but theirs better screws out there. I mean I keep those over my vehicles and I would hate to see them fall down due to cheaper screws. I would recommend better screws with this product but other then that I’m very happy with my purchase. Wanting to store my kayak and SUP inside for the winter at lake house, but not take up my floor space, I ordered this rack to see if it would do the trick. Took all of 10 to 15 minutes to install and adjust the height. What a difference it makes to have it stored at perfect height with low ceilings so I don't bump my head. Now I have my floor space back and I'm very happy with how it turned out. I do recommend. Great product. Well thought out, easy to put up. Love it. 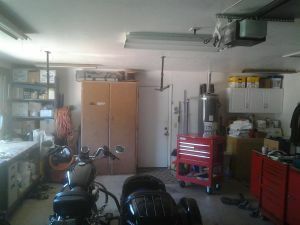 Easy to install and the system fits above the garage doors. I recently purchased 2 sets of these, I like the design and the relative ease of installation , however 4 of 8 arms suffered from the same annoying issue. When you depress the ball pin to slide the arm over the mount, the spring, because its not retained in place except by tension, slides up the arm just ever so slightly, but enough to make it so the ball pin does not extend, positively locking the arm in place. I then had to roll the foam back, remove the end cap and use a long bar (a 3/8" socket extension works well) to force the spring back down the tube and provide positive locking. Because I am working in tight quarters, I'm afraid that I may have to do this every season to load and unload. 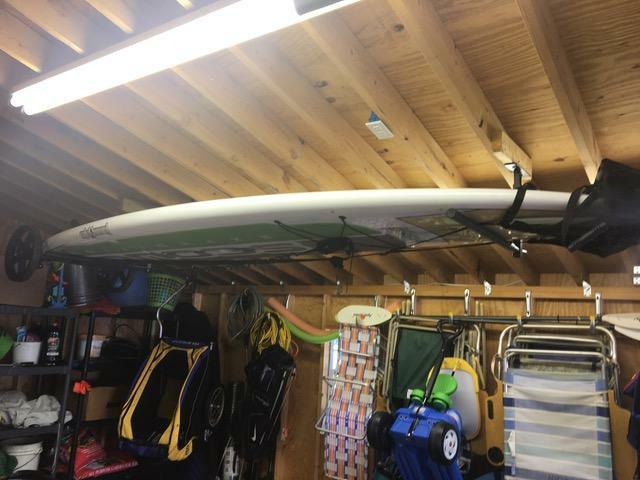 Great for multiple SUP boards. 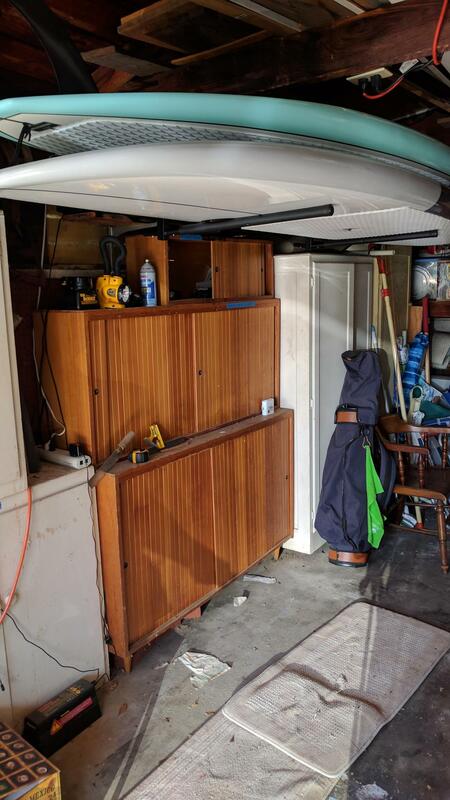 We have an extremely tight garage even if it wasn't full of our stuff, but this product is a life saver. We were able to move them from our floor rack and free up so much space. The reach holds them tight to the ceiling and out of my way. Installation was way simpler than I imagined and they went up very quick. Just two screws per support and then the arms snap in place. Great product and I would highly recommend for anyone with multiple SUP boards. The Hi Port 2 is everything I've been looking for. The main thing I was looking for was that it was easy to put up and to adjust. It only took barely no time at all to put up at all. Very easy to screw in under my deck and has different levels to adjust it to. Definitely very satisfied with the purchase and will buy again. I recently purchased the High-port 2 storage system. I was amazed at the simplicity of design, yet the effienciency of storage. The boards are stored very easily and it only took 10 minutes to install. I also like the wayn I could cutomise by lower it up or down which ever I choose. This is my second product purchaed from this company I have not been disappointed yet. When I ordered the Hi-Port 2 I wasn't sure it would work for my situation. 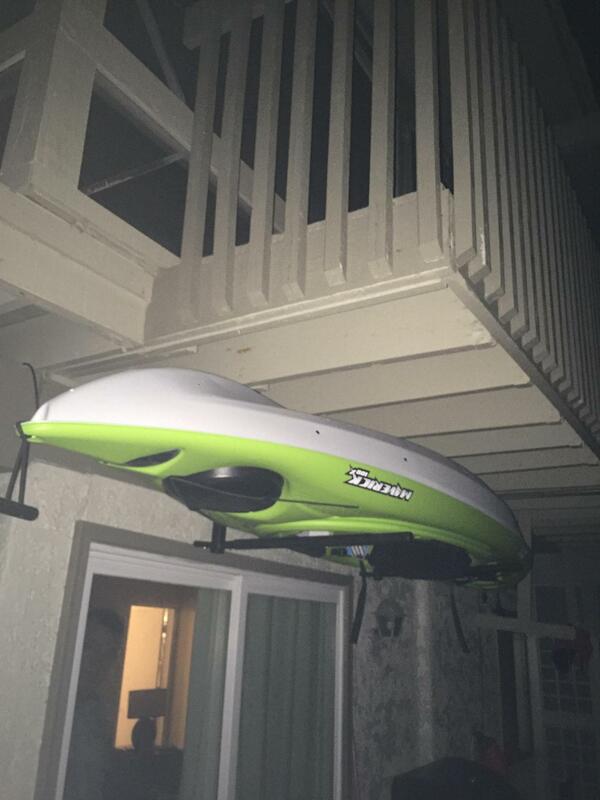 I keep my kayak in a lean to that the previous owner added on to the side of my garage. It has a steep pitch roof and what I ended up doing is screwing three wedges to the joists and then screwed a 2 x 4 to them to get a level plane. I then mounted the Hi-Port 2 to the 2 x 4 and using the lowest hole has just enough room to get the kayak on. This will save precious floor space. It went together like a breeze and is very solid. Excellent product! 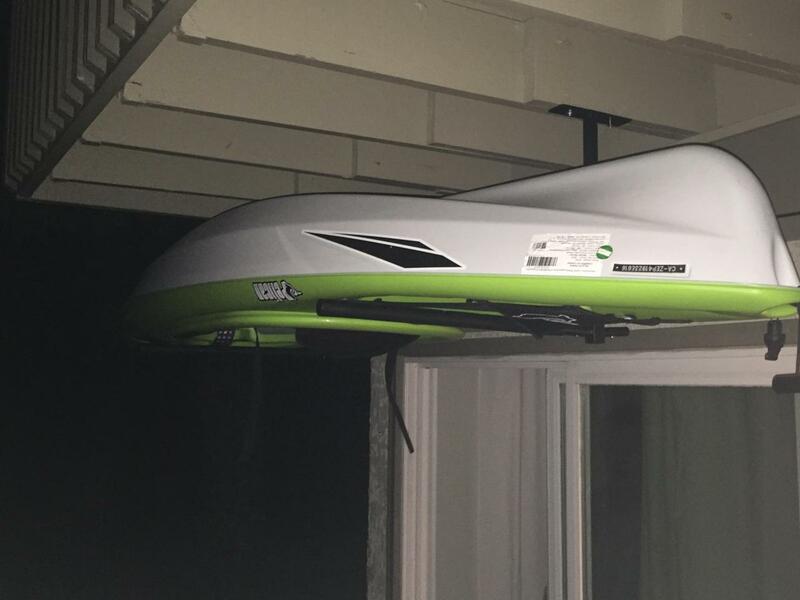 Perfect solution for storing SUP's above! 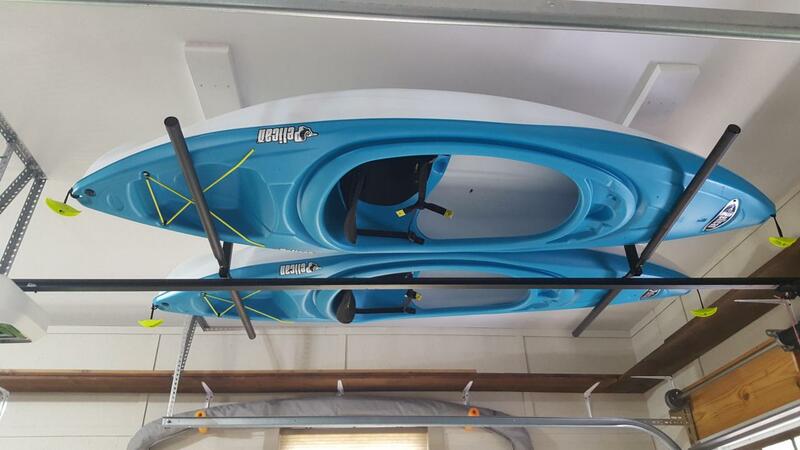 I was looking store a few kayaks and this rack was perfect for my needs. It was shipped quickly, had simple instructions and was an easy install. I predrilled holes to make the screws go in easier, used an impact driver and start to finish had the setup installed in about 15-20 minutes. I will probably relocate the rack to get it away from my shop light once I get more drywall done but that will be a 10 minute thing. For now I have floor space for my other toys! Very easy to attach to the floor joists under the deck/screened-in porch. Padded side arms slip on the hanging bracket without issue. Height adjusts to a number of different settings. 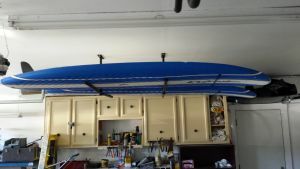 Great for keeping kayaks out of the way and off the ground. 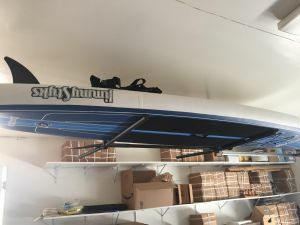 Purchased a second one to store 2 SUPs up high and out of the way in a basement storage room. Happy with that purchase too. Works great and has excellent adjustable features! I bought this to store two 10ft. 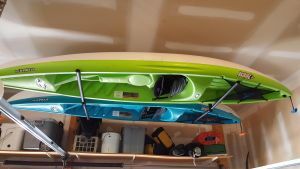 kayaks I recently purchased. The Hi-Port 2 was really easy to setup in my garage and adjust to get my kayaks up and out of the way when storing them. Everything fit well and installed in about 15 min. Really glad my coworker suggested it! I purchased the new Hi-Port 2…and it’s great. I use it for my SUP and I can even hang the board up with your SUP Bike Trailer attached. Then I just reach up, grab the Board, put it down, hook up to my bike or golf cart and away I go to the beach. Easy peazy!! I love it. Completely adjustable too! Perfect Rack...For Touring Skis Too! 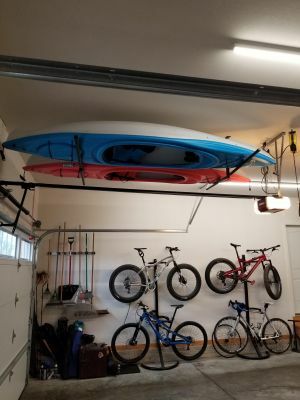 I know that this is intended to be a kayak/SUP rack, but this rack is exactly what I've been looking for to store skis out of the way but easily accessible in my basement "garage". The rack itself and the skis/poles on it feel very secure and at the shortest setting, my husband and I can pass beneath it with room to spare. I love it. One thing to note: we're using this rack with lighter weight touring and cross country skis. 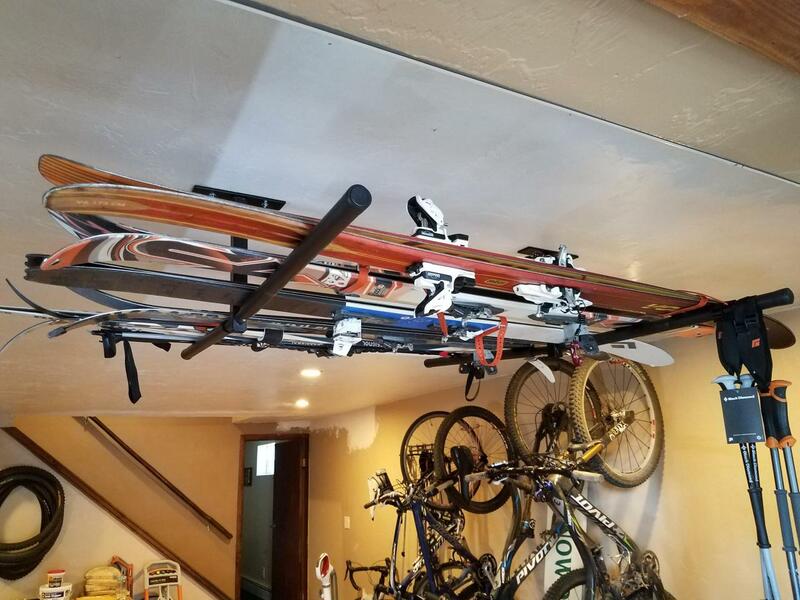 The instructions say not to exceed 100 lbs on the rack so I'd just double check your weights if you would plan on loading it up with eight pairs of super heavy resort skis. This rack is so versatile. It was easy to install and is very sturdy. 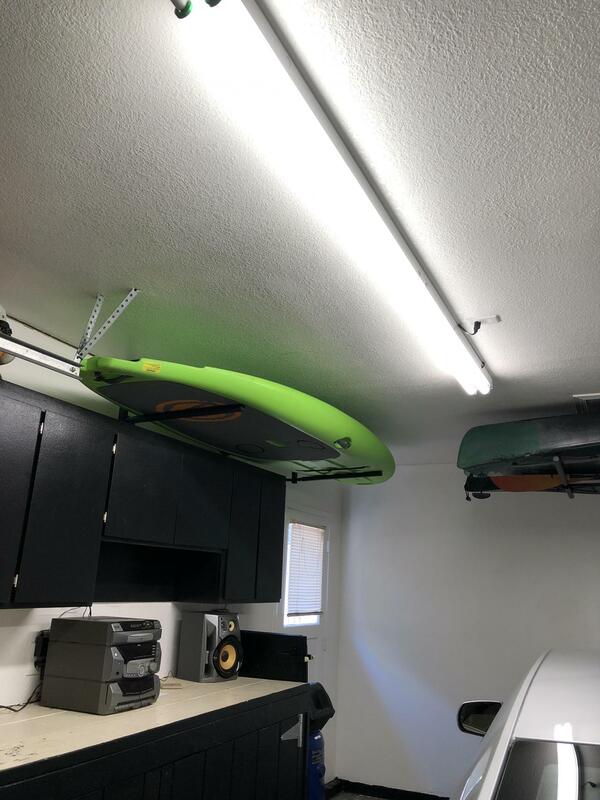 The height can be adjusted much lower than other ceiling racks making it easy to put our SUPs away. It is really easy on your shoulders getting the boards down. I would give it 5 out of 5. I had the storage racks up within about 15 minutes of receiving them, and that includes taking the time to make a sandwich first. Seriously, this product is easy to put up, and I had a kayak on it within minutes. Intuitive, simple, and effective. Awesome! Great product. Received delivery faster than I expected. Installation was easy. Unit is solid and holds my stand up paddle board with no problems. Big space saver and I believe I will now get more use out of the board since it is easy to access. Thanks! Finally got my two kayaks off the garage floor and in the Hi-port Rack. Easy to install and great to store the yaks. I love this storage rack, the versatility in installation is great! You can use one truss in your garage if you have a certain direction you want your kayaks to hang. Works great and is easy to install! 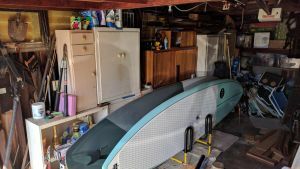 Our Kayak and SUP need a home during winter ag Lake Tahoe. This is a perfect solution, well manufactured and I believe will stay with us for a very long time. I installed it below one of our balcony where we will have no snow.